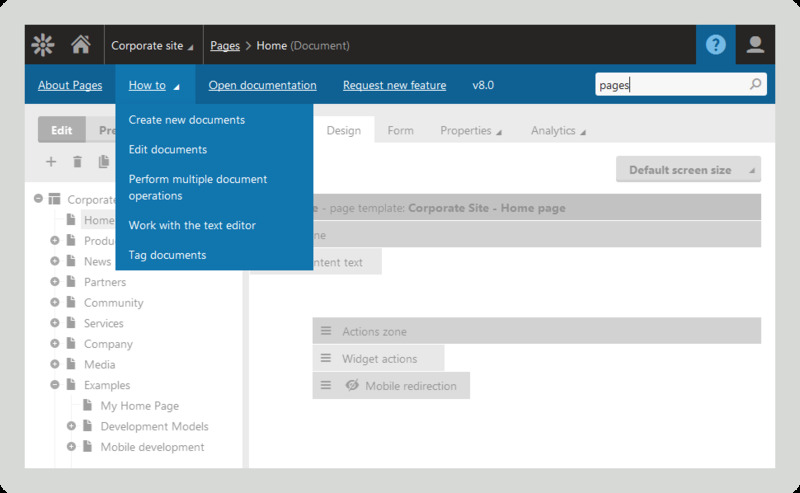 What is Kentico CMS ? Kentico Content Management Software lets you easily manage your content and website with its intuitive features. Its WYSIWYG editor, which is similar to Microsoft Word makes sure that even new users can quickly adapt to its interface and start getting productive from the word go. If you wish to manage multiple websites from one place, Kentico is the way to go. Its powerful multi-site management is very effective and can also help you create new sites within a matter of hours. Kentico also lets you create your own community forum which is a great way to increase your audience as well as customer satisfaction. 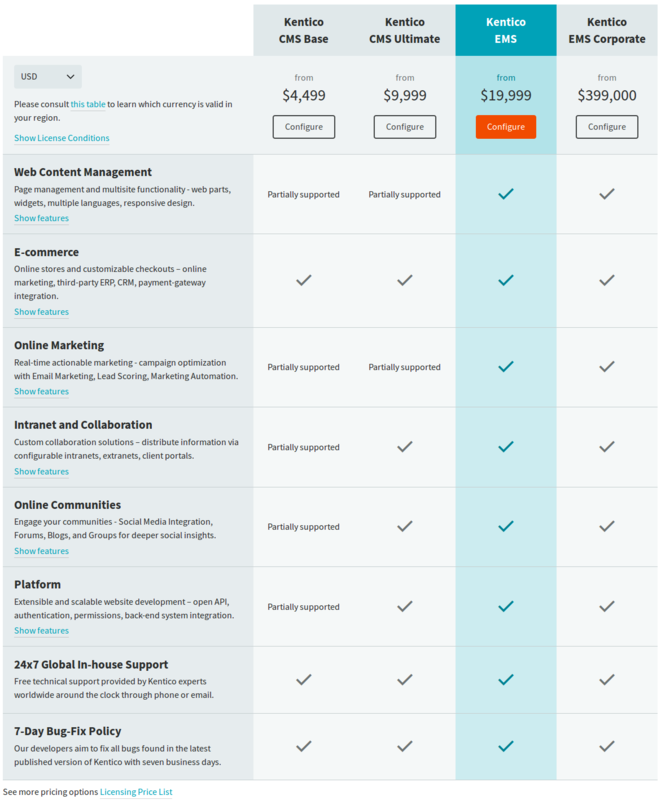 How much does Kentico CMS cost ? The pricing for Kentico CMS starts at $4499.0. Kentico CMS has 4 different plans such as - Kentico CMS Base at $4499.0, Kentico CMS Ultimate at $9999.0, Kentico EMS (Enterprise Marketing Solution) at $19999.0 and Kentico EMS Corportate at $399000.0. Based upon the number of Site Licenses, the pricing plan varies. Contact the vendor to get the latest pricing detail. Pros: The way content is structured and organized in Kentico is very intuitive, and allows you to structure your navigation based on how you structure your content. It's also very simple to assign roles to different areas of your site, so that you can restrict which users have access to make updates to specific sections. Cons: There aren't a lot of cons - maybe Kentico's need to try to get the CMS to do *everything*. 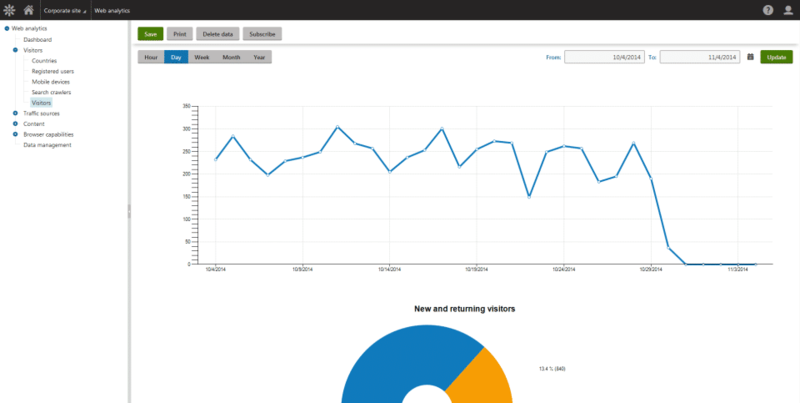 For instance, you're far better off using Google Analytics than Kentico's built-in analytics. Overall: This has been the easiest CMS to learn how to use, and definitely the easiest one I've had to train a client to use. Pros: It allows to quickly build complex, modern looking, responsive web pages. It has an intuitive staging to live site workflow. It allows to add custom code (html, css, bootstrap). 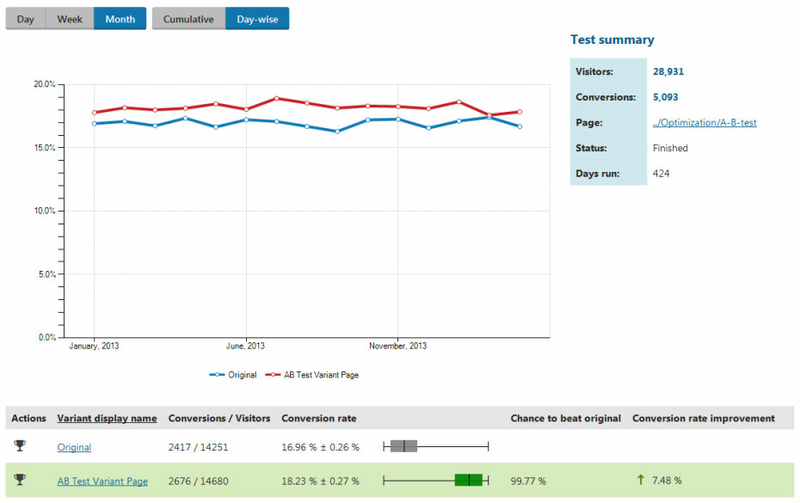 It also has tools to add metadata to the page for SEO improvement. You can build custom forms and a sophisticated media library. It allows a good integration with extraneous data sources. Cons: Building forms (especially a layout and validation) could be a bit of a burden. 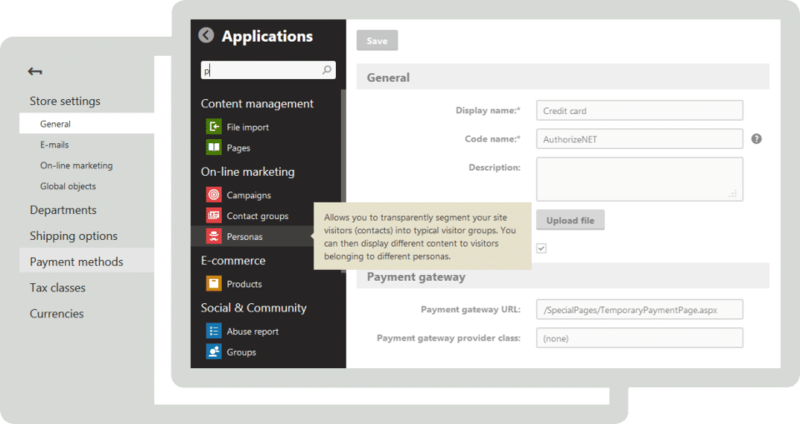 Overall: Overall, Kentico is a great CMS, intuitive for even a non-technical admin/content manager. It can be used for building pretty complex enterprise websites for variety of industries. Pros: The website is very nice looking. We've been able to put some pretty complicated customization in place. We have over 400 content pages on our website. Cons: The team that implemented this website went for a highly customized version. It makes any change to the website very difficult- even for seasoned kentico professionals. And, the back-end data is a mess. I have to view three different reports to get information on my users, their subscriptions and activity. It's been a challenge. - The analytics side of the system is sometimes lacking, which is why we eventually decided to switch. Kentico doesn't work like a lot of systems. It is well thought out, but if you are coming from Wordpress, Drupal, or even Sitecore, it's going to feel pretty alien. The system also suffers from jack-of-all-trades/master-of-none. I consider its CMS top-rate, but the marketing features are not quite up to par with the likes of Marketo or Pardot, and its e-commerce is very rudimentary (but getting better). That said, the integration out-of-the-box is where it wins, and having a less-than-leading-class marketing system that is truly integrated with your e-commerce is a substantial benefit and represents the real value of this system. You should expect to lean on an integrator or build in-house development expertise (full disclosure: I used to work at an integrator - I no longer do). While a lot can be done without actual C# code, building out the CMS is still a highly technical task, on par with development on other platforms. Kentico's underlying system has been around for many years, and has received some significant upgrades every year, but the core technology is showing its age. Kentico is taking some drastic measures to modernize the system and keep it supportable and relevant. But that may mean a bumpy road as you go through upgrades. Again, you will need some proper technical talent to keep the system running smoothly. "Great for Mid-Size to Large Companies"
The platform gave flexibility for informationally websites, B2B and Direct to Consumer. We were able to utilize the site we created and make it international also. It was customizable to meet our needs. We were able to add color swatch boxes, create custom reports, and add product page features that were necessary for our products. There were limitations, but always work arounds. We needed a lot of custom widgets and builds on the platform to meet our needs. Using a developer was costly, but 99 out of 100 times, we were able to achieve the desired outcome. I found some of the uploading of images and videos for web purposes to be clunky. This is a great platform and it's customizable. You can achieve many business objectives using the base platform and adding on through customization and coding. You do not need to be an expert at coding or developing to manage the sites. The user interface is easy to use and intuitive. You are able to limit the usage of certain user (i.e.... payment, customer inquiries, etc) without compromising security and user information. Selling directly to customers and also selling to distributors. It was a great solution for both. It had the ability to add on automated order processing - this software worked well with outside add on softwares. We were able to use a payment system that connected to all our existing systems. We also needed a program that a customer could place orders on and that the orders could transmit to our warehouses - we were able to built all the appropriate connectors. "Great all-around CMS for Enterprices"
The ease of use and the out-of-the-box feature set distinguishes Kentico from other CMS solutions. A great set of functionalities are available without the use of coding. They can be added on templates and can provide a rich set of features on pages/templates. The development curve is steep in the beginning and developers might find it difficult the produce the desired result. After the initial phase of understanding how it works the development is straightforward. If you are searching for a solid, fast, security content management system based on .Net technologies look no furhter. The only actual thing to consiser is price. Kentico offers variours versions with diffrent pricing and features. Even the basic version is adequate for most of the scenarios. Also. Kentico provides excellent 24/7 support and a 7-day bug fix policy. They release bug fixes every 7 days and they even create emergency bug fixes in extreme cases! When using Kentico CMS most of the functionalities are there and it is a matter of just adding the web parts needed. Another important aspect of the Kentico framework is security. Based on the latest standards Kentico offers unparallel security features and mechanisms that provide a solid foundation for website and application development. The development team does not have to worry about security issues on built-in functions since they are developed by Kentico and they are tested extensively. Also, Kentico provides a standard methodology for developing websites that follow the latest trends and standards for security and performance. Pros: 1. Highly configurable and adaptable according to your business need and requirement. Cons: The only con that i can think of is that the price is on bit higher end. Overall: I have built couple of great sites for my USA based client using kentico and the client is quite happy with the performance and maintainability of the site. Using kentico i have saved great amount of my development time as great feature like user management, single sign on using Facebook ,google and many other great features are just out of the box in kentico so you are not required to code them from scratch. Also my client is also quite happy since he can edit/change the content on the fly on his own and also he can see the business performance easily from the kentico dashboard which he can use in his business strategies and planning. 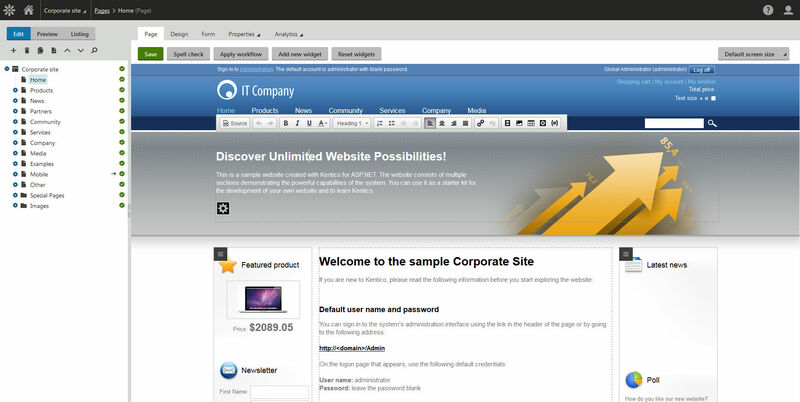 I think the interface especially the admin’s is much better than other CMS system I have used before. With its intuitive layouts it is much easier to assign and present management tasks on other coworkers. Kentico works as self-contained online store platform. It would be great if the integration with Google Ecommerce Analytics was easier to use instead of doing some customizations. Sometimes I have to search for a while to find features that I need. Also, I would like to see better documentation and I would be happy to use all its features. We were searching for a platform that will work as an Ecommerce site for our products. All its features work great to create modern online store and a platform that will keep track of the sales cycles for our products. Kentico offers great tools for supporting all levels of sales.